In a medium skillet, add 1 tablespoon of olive oil and heat until a slight shimmer occurs on the surface. In a separate bowl combine the shrimp, 1 tablespoon of olive oil and the sweet ginger garlic seasoning, tossing lightly until shrimp are thoroughly coated. Add the shrimp to the hot skillet, quickly sautééing until they are cooked and turn opaque. Pour in wine to quickly bubble and deglaze the skillet, scraping up the delicious brown "bits" on the bottom. Remove shrimp to a small bowl and cover to keep warm. 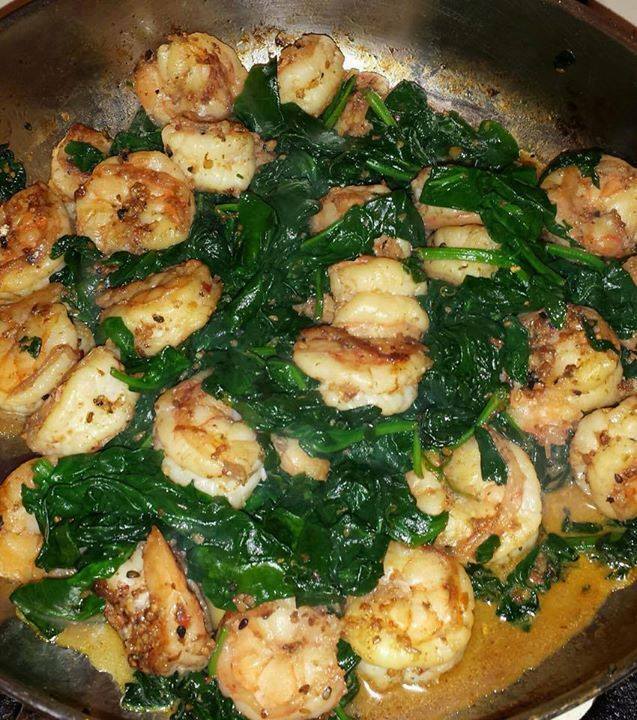 In the same skillet, add in the final 1/2 tablespoon of olive oil and toss in the spinach, quickly stirring until the leaves are just wilted. Throw the shrimp back in for a final "toss", then plate up on a small serving dish.